Native to Europe, the wild boar was introduced to Tennessee in 1912 by wealthy English sportsmen. The wild boars flourished, multiplying in the mountains. 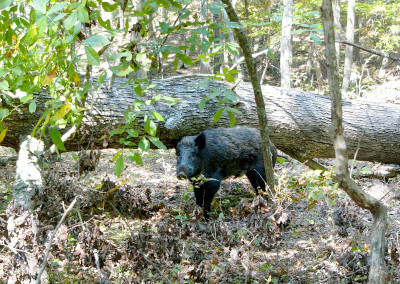 The wild hog you’ll face today is a mixture of the Russian wild boar and the famed southern “razorback,” mixing two ornery temperaments into one creature. Lucky for you, when you come face-to-face with those razor-sharp tusks, you’ll be the one with a gun. Enjoy hunting wild boar in their natural habitat. Prices are per hunter. From solo hunters, to couples, families and even TV personalities, Caryonah has hosted an array of hunters that have all had successful experiences. Below you can see just a few of our hunters and their wild boar trophies. I couldn’t be more pleased with Caryonah Hunting Lodge. What an exciting and memorable Russian boar hunt for my son, who just graduated from Southern Illinois University. Everyone, including hosts, guides, cooks, meat/cape processor, dog handlers, and, yes, even the dogs, delivered 100 percent. My family hopes to make Caryonah an annual event. Job well done, Caryonah.